Many books, history books included, have a page of acknowledgments. Along with the usual thanks to colleagues and family, appreciation is often expressed to librarians and archivists who have offered assistance along the way. In this book, the author Tony Moore makes another acknowledgment. It is to the commissioning editor of Murdoch Books, Diana Hill, who selected him to fulfil the brief for this book. Commissioned books, of course, are nothing new: institutions and individuals have often paid a writer to document and argue their significance to a wider audience. But this commission is slightly different in that it was for a narrative concept- transported rebels to Australia- left to the historian chosen to flesh out. When Tony Moore spoke at the Australian Peace Coalition seminar I attended recently, he noted that the ABC has since commissioned a documentary series based on the book. Certainly the book and the topic is ripe for a television series. It has, in effect, five self-contained episodes, studded with articulate, interesting people, and ripping yarns of defiance, escape, coincidence and courage. He notes that when he was growing up, Australian history seemed bland and uninteresting, especially compared with European, American, African and Asian history with blood, revolutions, wars etc. He later came to learn that Australia had its own robust history of dissent and resistance to authority, and the blood and war was there all along. We elide the nuances when we uncritically celebrate the convict trope of the “poor downtrodden peasant transported for stealing just a ribbon!” and we are largely unaware of the political prisoners transported to Australia: 3600 of them out of a total of 162,000 sent between 1787 and 1868 when transportation finally ceased in Western Australia. Of these political prisoners, 2500 were from Ireland, 1200 from England Scotland and Wales and 151 from North America. It is these political prisoners that Moore deals with in this book. Moore commences with the Scottish Martyrs of 1798 who, in a time of high anxiety stoked by the French Revolution just across the channel, espoused Enlightenment ideas of liberty, organized Conventions, were sympathetic to Irish resistance, and distributed, wrote and read from ‘seditious and wicked publications and writings’. Thomas Muir was a university-educated gentleman; Thomas Palmer was a Unitarian pastor (and one of the heroes of modern Australian Unitarianism) and they, along with William Skirving, Joseph Gerrald and Maurice Margarot were transported to New South Wales. Thomas Muir’s story story in particular is a ripper- there’s a ABC terrific podcast about him here. The next chapter moves to the Irish rebels of the same time, whose perceived danger to the British Government was heightened by the French Revolution, and with good cause. The United Irishmen, founded by educated and propertied Presbyterians in Belfast, joined with the Catholic peasants in a civil war that could easily have become international had the planned French invasion eventuated. When the uprising was finally quashed 30,000 people were dead, including many non-combatants, and millions of pounds of property was reduced to ruins. Approximately 660 Irish rebels were sent to Botany Bay as a result. Chapter 3 ‘Protest from Below’ is a chronological examination of protest from working people in England, beginning with the six Methodist-inspired Tolpuddle Martyrs, moving through to the Chartists of 1848. Moore picks up on historian George Rude’s three-stage categorization of such protests: the anti-industrialization riots following the Napoleonic Wars; the change during the 1830s from the ‘primitive’ protest of the Swing Riots to the almost-modern trade unionism of the Tolpuddle Martyrs, and the Chartism of the 1840s. The next chapter ‘North American Patriots vs the Empire’ examines the rebels transported to Australia following the Canadian Rebellions of 1837-8. In all there were 151 – fifty-eight of whom were French-speaking Lower Canadians, and ninety-three from Upper Canada. Interestingly, 75% of the Upper Canadian rebels were actually United States citizens who had crossed the border to assist the supposedly tyrannized subjects of the British Crown on the other side. There’s an interesting discussion in this chapter about the meaning of ‘patriot’, as all sides in this rebellion claimed it for themselves. This chapter was the reason that I read the book, because my own Judge Willis plays a minor, purely symbolic role in the rhetoric of the Upper Canadian rebel leader, William Lyon Mackenzie (of whom I write more in another post). Chapter 5 returns to Irish rebels again- this time the intellectual Young Irelanders of 1848, headed by William Smith O’Brien (“less Braveheart than Mr Darcy” p.321), the wealthy Thomas Meagher, and radical poet and writer John Mitchel and Gavan Duffy whose story might not be as ripping as Thomas Muir’s but just as mercurial with him ending up Premier of Victoria. The chapter ends with the Fenians of 1865-7 sent to Western Australia (by then the only Australian colony still accepting transported prisoners) and the rescue mission by the American-flagged ship, the Catalpa. 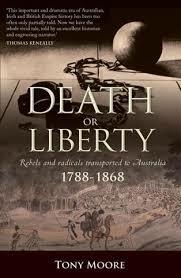 Moore makes many connections between the rebels and radicals of 1788-1868 and current events, referencing the legislation passed as part of the War on Terror, the shock of Western governments at learning of ‘home-grown’ Islamists in their midst, and the networked nature of Al-Qaeda. There is, of course, the appeal of instant identification in such an approach, but sometimes anachronism obscures and confuses more than it illuminates. Even though the book does deal with experience of these transported prisoners in New South Wales, Van Diemens Land and Western Australia, much of its focus is fixed on Britain. Partially this is because the documentary record within the penal settlements is so straitened by bureaucracy compared with the richness of the literature surrounding the rebels, written both about and by them. Stripped of their rebel identity through the process of transportation, many of them disappeared into the assignment system and their record becomes merely genealogical. The intent was to silence them, and in this regard, transportation worked. But it’s also the case that this book is very much about the anxieties of Empire and the British Government’s attempts to control and corral dissent. Moore does explain social and political change, but the British Government itself comes across as monolithic and largely unchanged, despite the Reform Act and the varying philosophical/political tendencies of successive Tory and Whig administrations. Perhaps this is a statement about the nature of power – that repression is the same everywhere and everytime? Britain had a differentiated transportation system for prisoners arrested in different colonies. The Australian penal settlements received rebel slaves from the West Indies, Khoi from the Cape and Maori militants from New Zealand, while the Andaman islands off the coast of Burma received prisoners from the Indian mutiny of 1857 and other subcontinental rebellions. The usual practice was for prisoners sentenced to transportation by judges in the North American and West Indians colonies to send them back to England, from where they would be despatched to Australia. The Canadian rebels were an exception to this practice. The British government had learned with the Tolpuddle Martyrs that rebels could generate negative publicity for the government, and so they were sent direct from Canada to Australia. While many of these political prisoners remain unnamed, the transportation experience for high-profile leaders often differed to that of your ‘run-of-the-mill’ convict. Clearly the British Government was uncomfortable about exposing ‘gentlemen’ to the lottery of the assignment system, and several of them returned to Britain afterwards- an unusual coda to the convict experience. The book highlights the international nature of resistance even then. The driving ideals of the French and American Revolutions were picked up by the Scottish Martyrs and the United Irishmen in the late 1700s, and there was a steady traffic back and forth between Continent and Britain for the leaders. It’s interesting that the United States acquiesced in the transportation by a foreign power (Britain) of its own citizens captured after the Canadian rebellion, and we see both Thomas Muir and the Catalpa Rescue drawing on international connections to effect their escapes. This book is written with a lively, light narrative tone but, given that it has been commissioned as popular narrative history from the start, it maintains its academic fidelity as well. Moore names the historians he has drawn from in the body of the text (instead of the anodyne ‘A historian claims…..’) , and a quick check of the footnotes shows that in each chapter he relies heavily on one or two of the authors he has acknowledged in his introduction including Frank Clune, Tom Keneally and Robert Hughes. In this regard, it is a synthesis history drawing on a smallish number of rather dated secondary sources, and particularly George Rude’s Protest and Punishment for its theoretical discussion of protest and dissent. His short conclusion closes with a discussion of the relative silence of Australian historiography about these rebels, especially compared with the recognition that they have been given in their places of origin. He raises the question of the contribution of these rebels to later Australian history and to political change generally, and I wish he’d taken this further. He hasn’t convinced me that these individuals affected Australian politics to any great extent, although I acknowledge that the push of the wider movements, of which they were often in the vanguard, did contribute to change. Nonetheless, I look forward to the television series based on this book on the ABC soon and I hope that it was funded from this years’ budget instead of next years. This entry was posted in Australian history, Book reviews and tagged Tony Moore. Bookmark the permalink. I was drawn to this book by its local connection here in Illawarra. See my post. I don’t think anything much has changed today, alas. You mention Jacobites, republicans and Chartists etc and note that many of these prisoners were actually heroes and martyrs to their own communities, not villians at all. When Tommie Smith (USA, gold) and John Carlos (USA, bronze) received Olympic medals in 1968 for athletics, they raised their arms in a black power salute. Australian Peter Norman stood quietly with his silver medal, but was vilified and punished back at home…. and was never allowed to compete for Australia again. He should have been a hero, not a felon.